We provide conflict resolution training in a range of different areas as well as bespoke training for particular situations. Mediation Skills training - a 6-day course, over two 3-day sessions, which gives attendees the skills to provide an effective mediation service. We have provided this course to hundreds of trainees over the last 12 years and for organisations such as universities, local authorities and community groups wanting workplace mediation training in order to establish in-house mediation services. Conflict Coaching Skills training - this is a 4-day course over two 2-day sessions which gives attendees the skills to work 1-to-1 with individuals experiencing some form of unresolved conflict or relationship difficulty. There are an enormous number of situations in which Conflict Coaching can be used within the workplace, within families and within wider community settings. We have had a lot of interest in this pioneering new field of conflict resolution training and have trained people who want to use it as an additional service to those they already provide or as a new support option within organisations. Conflict Coaching differs significantly from counselling and should not be confused with this. Managing Conflict in Teams - this is a 1 day workshop followed by 2 half-day review sessions, usually with 2-3 months between each session. We have provided this in Universities to help Managers review and improve the ways in which they communicate and respond to conflict within the teams they manage. It introduces Principles of Effective Communication and Conflict Resolution drawn from the experience of mediation and conflict coaching and goes on to introduce and give opportunities for practise in communication skills that support effective listening and creative thinking in response to unresolved conflict. Dealing with difficult behaviour -this is a 1-day workshop and was originally provided for staff working in voluntary and other community groups in London Borough of Hillingdon to help them interact more effectively with clients and colleagues and also to support clients more effectively in ways that support their empowerment rather than fall into 'doing things for' them when they would normally be able to do or learn to do them for themselves. Managing difficult conversations with constituents - this was a half-day workshop provided for Councillors in a London Borough Council to enable them to more effectively respond to difficult situations they encountered with their constituents. Committee or Meeting Skills Training - this training is for groups with management committees who would like support in running their meetings more effectively and responding to difficult situations and relationship and communication difficulties between committee or meeting group members. 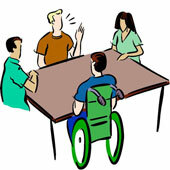 Topics covered include Chairing skills, Effective communication in the meetings, Developing Teamwork. The training can be provided via a 1-day 'intensive' or via a series of 4-5 evening sessions of 3 hours. Go from Conflict Resolution Training to our Enquiry Page if you would like to ask for more information.